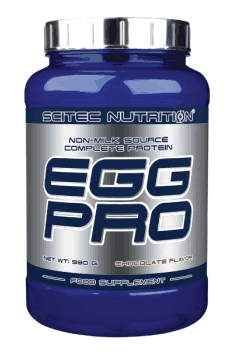 Scitec Egg Pro is source of highly assimilable protein from egg whites. The supplement is characterised by a high rate of amino acid assimilability, a low content of fats and carbohydrates, and a delicious flavour. Additionally, the producer added taurine to the product, a substance which regulates nitrogen metabolism in the body. The protein supplement is perfect for those who need help meeting the daily amino acid requirements. There are many protein supplements on the market isolated from various sources; however, egg white protein is believed to be the so-called model protein. Egg white protein is characterised by an amino acid profile perfect for the needs of the human body, which is why it has a high biological value (BV). Eggs have BV=100, which means that the protein it contains is efficiently used to satisfy the needs of the organism. Isolated egg whites constitute a blend of nearly pure amino acids containing as much as 22 g protein per serving. In comparison with other sources of amino acids, egg proteins have a low content of carbohydrates (1.8 g per serving) and no fat. Thanks to that, the supplement provides few calories, which can be beneficial for people who want to lose weight. Many people are intolerant to the sugar (lactose) or proteins found in supplements based on milk whey. Chicken egg white is a perfect substitute because, contrary to plant proteins, it has the full aminogram and a high content of essential amino acids. The supplement should prove excellent for people who do not tolerate proteins obtained from milk whey very well. Taurine is an amino acid whose high concentration can be found in the skeletal muscles and whose function is participating in the storage and transport of nitrogen in the organism. It regulates the balance of cell fluids and fluid and electrolyte balance, supporting the transport of nutrients to muscle tissue. It stimulates the activity of insulin and IGF-1 and improves insulin sensitivity in muscle tissue, that way exerting a beneficial effect on the process of muscle mass building. Protein is the basic structural element of the muscles, so a proper protein supply is essential for the development and maintenance of muscle mass. Supplementing amino acids also increases the activity of highly anabolic hormones, such as insulin or insulin-like growth factor-1 (IGF-1). They accelerate the synthesis of new muscle proteins and help to provide tissues with nutrients needed for growth and regeneration. People who want to get rid of adipose tissue must pay particular attention to a proper protein supply, as they prevent muscle mass loss. A calorie deficit increases the activity of catabolic processes, which obtain amino acids from muscle tissue if their supply with food is insufficient. Moreover, an increased intake of protein on a reducing diet helps to stay in control of appetite and maintain satiety. In summary, Scitec Egg Pro is a high-quality protein supplement with a unique flavour, containing only egg whites. It is characterised by a high biological value, a low content of carbohydrates and fats, and an addition of taurine. By providing proper amounts of protein with a positive aminogram to your body, you ensure efficient support for your muscle anabolism and catabolism prevention. The product with prove excellent as a substitute for supplements containing milk proteins, which can cause digestive problems in some individuals. Egg White Protein powder, Dextrose, Fat-reduced Cocoa Powder (10-12%), Flavors (Vanilla, Chocolate), Sodium Chloride, Thickener (Xanthan Gum), Sweeteners (Acesulfame K, Sucralose).